Why choose B&B RV, Inc.? B&B RV, Inc. is a family owned and operated company that has been specializing in RV rentals since 1999. We own and maintain our own extremely modern fleet to insure the highest quality units and the least problems possible. Renting an RV is very different than renting a car, hotel or house. We have a dedicated full-time staff to assist in the rental process from start to finish and a large enough fleet to adjust when issues like accidents occur. There are a lot of options when looking for RV rentals and our goal since we opened our doors has been to create the best overall experience for our renters and their families. Fraud is common these days, so be aware of who you are renting from, what you are getting, the maintenance/cleaning process, etc. 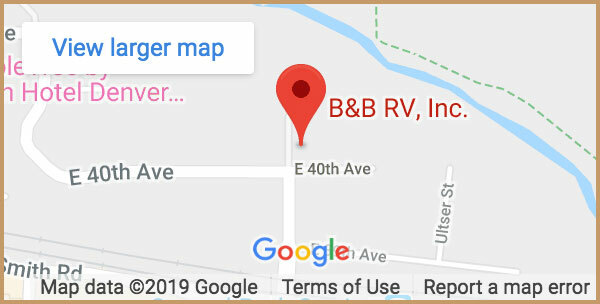 B&B RV, Inc. owns the entire fleet so we offer newer year models and specific floorplans – you’ll know exactly what you’re getting. We also maintain detailed cleaning and maintenance schedules for each one of our motorhomes. You’ll get customer support throughout the entire rental process. We are here to help if you have any questions or concerns before, during and after your rental. The prices vary depending on the size of the unit, time of year and multiple other factors. All of our pricing can be found each of the rental pages of our website. Class A RVs, Mercedes Diesel RVs, and Class C RVs. You will get 100 free miles per rented night. Anything additional is 39 cents per mile. This is cumulative for your entire trip. Example: A 7-night rental will receive 700 free miles. We only charge for actual mileage used opposed to requiring you to purchase mileage “blocks”. Do you charge for generator time? You will get 3 free generator hours per rented night. Anything additional is $3 per hour. This is cumulative for your entire trip. Example: A 7-night rental will receive 21 free generator hours. There are no credits for unused hours. Yes, we do have pet-friendly units available in each model. There is a one-time pet fee of $125. You can call to inquire on availability of a pet unit in your desired size. Unfortunately, we can no longer accommodate cats in our RV’s although dogs are still welcome! To reserve a rental unit, we take a $500 non-refundable down payment that is applied toward the total cost of the rental. The remaining balance of the rental is due 30 days prior to your pick-up date. We will email you a balance due reminder and then charge the remaining balance of the rental cost to the credit card we have on file. If you want to reserve within 30 days of your pick-up date, the full amount of the rental is due to create a reservation. There is a $1,000 damage and a $250 cleaning deposit that are run on your credit card the day of pick-up as an authorization only. This puts a temporary hold on the funds. If you return the unit in acceptable condition based on your selected package, the authorization automatically clears from your account. What are the regulations for driving the RV? Each driver must be at least 25 years of age and have a valid driver’s license to drive in the U.S. Each driver will need to have proof of insurance that specifically extends to cover a Motorhome rental. If any driver in your party does not have auto insurance that will extend to an RV rental, they can purchase insurance through our insurance provider. The insurance from our provider covers up to 4 drivers. Do I need insurance for the rental? Before your scheduled rental pickup, you will need to contact your insurance company to see if your auto insurance will extend to cover a MOTORHOME rental. If they do extend full coverage (comp, collision and liability), your agent will need to send something showing proof of that coverage including your deductible amounts. We can provide you/them with the vehicle information (year, make, model and VIN), if needed. If your insurance does not extend to cover the rental, you will need to purchase insurance on the day that you pick up your rental. This insurance is offered through a third party at a daily price that varies depending on the size and value of RV you are renting. This insurance will cover up to four drivers that are 25+. What is included with the “Value” package? B&B RV, Inc. will clean and wash the vehicle, dump the waste and fill the propane upon your return. You just need to fill up the fuel tank! What is included with the “Works” package? The Works package can only be purchased in combination with the Value package. If purchased, B&B RV, Inc. includes a kitchen package, dishes package and linen package for the amount of people specified. Specific item lists included in the packages can be found under the pricing for any of our rental options. Is there a minimum number of days I need to rent the RV? B&B RV, Inc. is now happy to offer a three-night minimum year-round. How much lead time do you need to make a reservation? Due to insurance restrictions, we require at least 48 hours notice to make a reservation. All of our services are first come first serve, so the earlier you reserve the more likely you will get the product and date time frame you desire. You can use our secure web reservation request form, call in to make your reservation over the phone or come to our office to make the reservation in person. We require a non-refundable $500 reservation deposit to secure the rental, unless you are booking within 30 days of your departure date. In this scenario, the full departure balance is due to make a reservation. What time can I pick-up the rental? Rental pick-up times are scheduled one every fifteen minutes and offered based on availability at the time of the reservation. It is imperative that you show up at your allotted time to ensure the appropriate agent is available. Who needs to be present when we pick up the rental? Anyone who will be driving the RV needs to be present for the rental pick-up. Each driver will need to show their driver’s license, sign the rental contract paperwork, and attend a walk-through orientation of the actual rental RV. If you have a driver that will not be present at pick-up, you must coordinate with our rental team prior to your pick-up date to assure the proper paperwork is completed. How long does the rental check-out (pick-up) process typically take? You need to arrive at your scheduled pickup time and have watched the walk-through videos sent to you. Once all drivers are present, we will then go over your rental contract and verify insurance. Then, we will walk you around your rental RV to ensure you are comfortable with the functionality and we will mark down any existing damages on the RV. When you receive your reservation confirmation, it will include a walk-around video of the inside and outside of an RV as well as a driving safety video. These videos are to be watched PRIOR to your arrival on the day of pickup. We will send a reminder about these 2 weeks before your pick-up date. If you watch these videos prior to your arrival for pick-up, the process usually takes about 30 minutes. If you have not watched the videos when you arrive, you will be required to watch them prior to your walk through extending your time here significantly. What is expected when I return the rental and how long does the process typically take? All rentals are due back by 11:00am on the scheduled return day. You may purchase a late return, if our schedule permits, allowing you to return by 2pm. Unscheduled late returns WILL be charged a $500 late return fee. To expedite the process, you will need to ensure you return the RV full of fuel and in the condition determined by your selected package choice. The complete process should only take approximately 20-30 minutes. If you are in a rush, you can opt for the “Express Check-in” option that allows you to leave while the vehicle is being checked in. Once we complete the check-in process, we will call you and review any final balance. Can I leave my car on your lot while I travel? Yes, we do allow you to leave one vehicle here while you are on your trip. It will be parked in our fenced in lot but we assume no liability for the vehicle while it is here. We require that you leave a spare key in case we need to move it. How do I get to your location from the airport? You need to arrange your own transportation through the local train line (RTD A-Line), taxi, shuttle or rideshare (UBER, LYFT etc.). We are only located about 17 miles (approx. 25 minutes) from the airport and about 2 blocks from the Central Park A-line stop for the train (RTD). What power do I need to hook-up the RV at a campsite? All of our rentals* have 30 amp connections and will come with an adapter for 15 amps (normal household plug). *The Thor Windsport needs 50 amps but can convert to 30 amps, if needed, limiting use of both A/C units. What if there are no hook-ups available during my trip? Every RV rental is equipped with an on-board generator. The gas motorhome generators run off the same fuel as the engine. The diesel motorhome generators run off the propane tank. The generator will power all items that require 110v power including the A/C unit(s), microwave, TV and anything else you are trying to plug in to an outlet. Most campgrounds have posted hours that they allow the use of the generator. Can I plug my oxygen or c-pap machine into the RV? If these machines require a standard outlet (110v), you will need to either run the generator or plug the vehicle in to an external power source to plug in the machine. All of the rental units have a 12v connection somewhere in the vehicle, if you have an adapter to use. If the 12v connection is only on the dash (as it is in some of the units), it will run on the engine battery so you must be careful not to drain the battery. Please call for further information on this. Are there restrictions on where I can take the RV? You can drive the RV to anywhere in the United States or Canada (with written consent). The rentals are not allowed into Mexico as the insurance does not apply. Yes, but there are several factors to take into consideration. From first freeze to last freeze (approx. October – May), we have all our RVs winterized which means the water system is shut down and there is domestic anti-freeze in the systems. If you are travelling to a destination with freezing temperatures, you will not have use of the water system. If you want to use the water, and we deem the destination to have favorable weather conditions for water, there is a one-time $245 fee for the un-winterize/re-winterize. Insurance does not cover any damages caused by frozen holding tanks, waste tanks, water heater tanks, etc. If you choose to have water, and get damage from freezing, the repairs would be your financial responsibility. Can I take my bicycles? Yes, there is a 2-inch receiver hitch on the back if you have your own bike rack to attach. You can rent a bike rack from us for a one-time fee of $65. There is a non-refundable $500 down payment applied when you make your reservation. The remaining balance is paid 30 days prior to the pick-up date. If you cancel your reservation, we don’t offer any refunds. Instead you would get a credit for the amount that you already paid ($500 or the total depending on timing of cancelation) to use towards a future rental within 12 months from the date that you cancel. We charge no additional fees for cancelation or date changes. Can I tow my trailer? If you purchase insurance through our insurance carrier for the rental, then you cannot tow anything. If your own auto insurance extends to cover the rental, you can only tow something if it weighs less than 2,000 lbs. All towing equipment is your responsibility. What happens if I go on a toll road with the RV? The toll roads in Colorado do not require cash payment. They take a picture of the license plate and send a monthly bill. Once we receive the bill for any tolls you incurred during your rental period, we will email you the total and charge the expenses to your credit card on file. We do charge a $10 processing fee. The bills can take anywhere from 3 weeks to 2 months to arrive at our office so we reach out as soon as possible. Am I provided with snow chains? No, we do not provide any snow chains and you cannot put any on our vehicles. If you are traveling somewhere that requires them, you will need to change your route accordingly or wait until conditions allow you to pass. What is the process if I encounter a problem on the road? We have a newer, upgraded rental fleet and a very thorough maintenance schedule. Due to this, major problems are very rare. However, if you have an emergency on the road, please make sure that everyone is safe (pull-over and secure things safely), then get the assistance you need. Treat any emergency situation or roadside breakdown as if you were in your own vehicle as you will be able to obtain help much faster than trying to reach us for help. You will know much more about your location and available services nearby. Please keep us in the loop if an emergency does happen and let us know if/how we can assist. In the case of non-emergency issues, we include a detailed user guide in every unit that can help with general questions/issues. Feel free to reach out to us here at B&B RV, Inc. during business hours and we will help in any way we can. If it is outside office hours, you can seek help on your own and notify us of the situation once our office is open. If you get a flat tire, we do provide the spare tire but we do not include any of the equipment needed to change to tire. You would need to go to a tire/repair shop to have the tire replaced or have a properly equipped tow truck complete the task for you. If you have any other questions, give us a call at 303-322-6013 or visit us at 8101 East 40th Avenue Denver, Colorado!